Summary: This walk is stunning which really met my expectations. 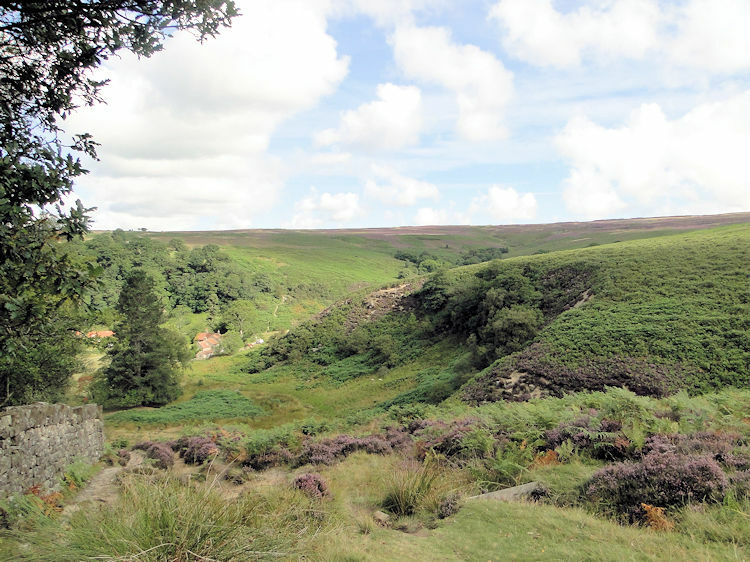 The walk from Goathland has many spectacular moments with great views both local and distant and in late summer the heather bloom is one of the most incredible sights. 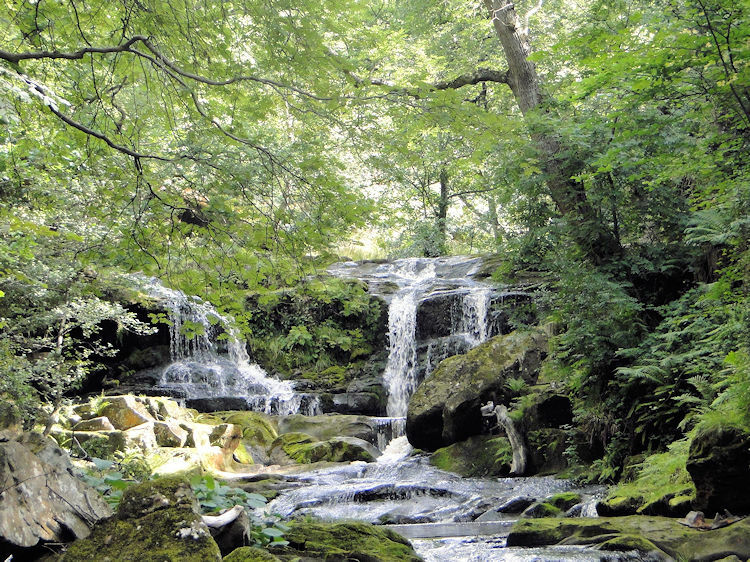 Then of course there are the waterfalls which need care taken when visiting but are well worth the effort. I reiterate, this walk is best when heather is in blossom. 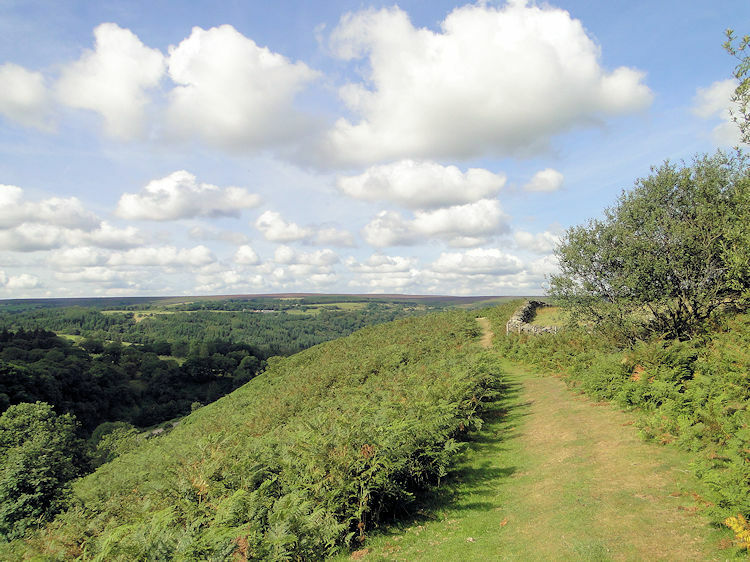 The Walk: Once in a while I discover a new walk which pricks the consciousness, a walk so spectacular that I finish awestruck by all of the beauty I have just experienced and this walk centered around the popular moorland village of Goathland is one of those walks. 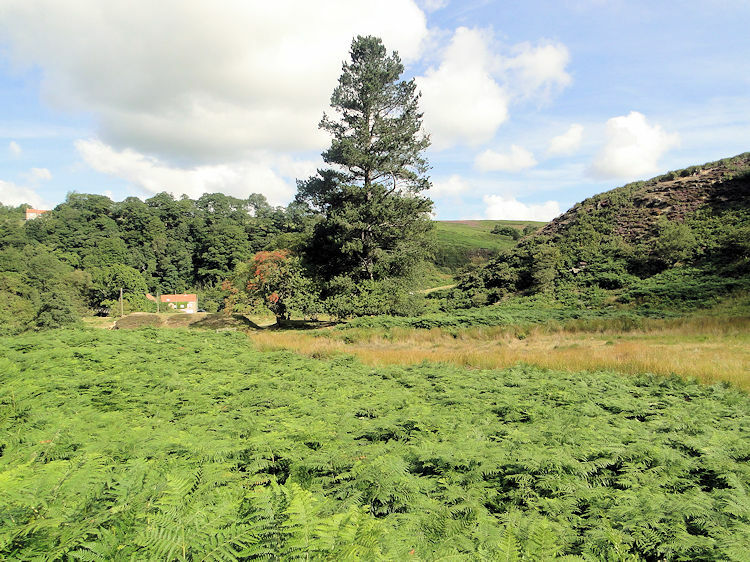 It was a fine day in late August with the forecasters promise of sunshine and the possibility of showers in my mind as I set off from home in Harrogate to drive to Goathland in the beauty of the North York Moors. I parked up near to the Mallyan Spout Hotel and set off walking. 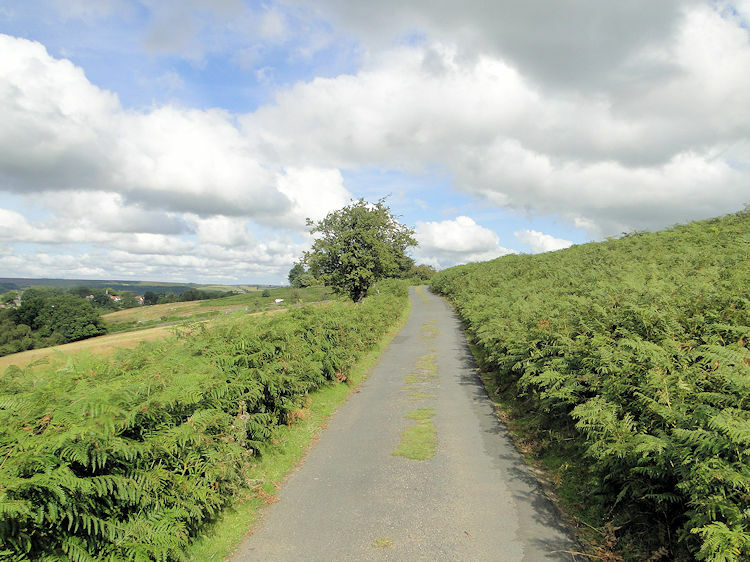 My planned route took me from the village on an easterly course across fields, a lovely regular start to the walk which I spent looking up to the sky and the clouds that were bubbling up and streaming overhead. Sometimes they were heavy and large enough to temporarily block out the sun but I hoped the weather would improve rather than deteriorate as I walked on. After walking through four fields I reached a quaint footbridge over a tiny tree lined beck and as I crossed it I could hear voices close by. I spotted the talkers and then more as I had happened on a field full of caravanners. Walking through while saying a few good mornings to the temporary field residents I then reached and crossed a road and then after walking a short distance on a bridleway I passed under a railway bridge at Abbot's House to arrive at another quaint footbridge. Thus far the fields, tracks and copse dells had been lovely, nothing extraordinary but that was soon to change. From Abbot's Bridge I climbed up a path beside a second field of caravanners, the last of my journey and then I walked a short distance on a narrow path through a fern field which again slightly uphill had accessed me a lovely view of open moorland which was lush purple with beguiling heather in full bloom. I was on Mill Moor and it was a sublime sight, the first of many to come in a walk that was becoming increasingly spectacular. 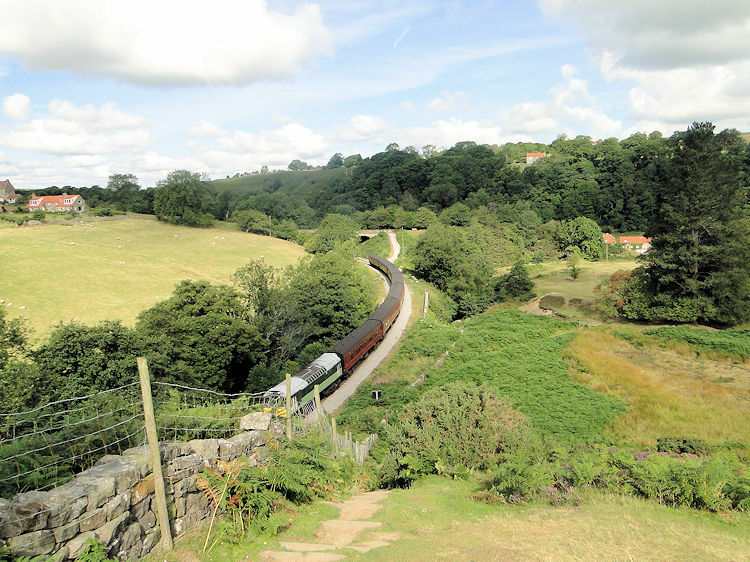 From my vantage point I then descended towards Goathland Station. 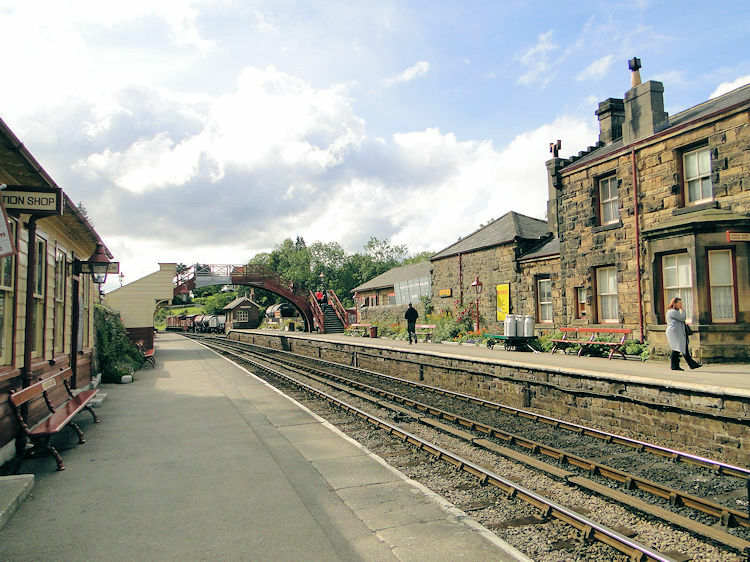 I detoured from the path into Goathland Station for a glimpse of the old fashioned station so much used in the TV series Heartbeat. 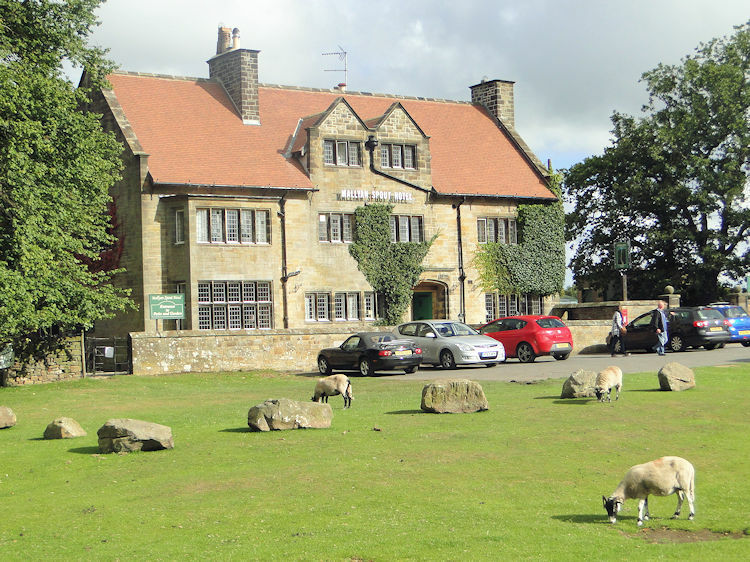 It was used as a backdrop for new characters arriving in the village of Aidensfield and more often for when characters left the fictional village for pastures new. For example in the very first leading character PC Nick Rowan left to start a new life in Canada. My question is why would he leave such a beautiful place as this? Station visited, very nice too. Walk resumed and I climbed from the station walking close by verdant green oaks and purple heather to another awesome moment, one that stopped me in my tracks. 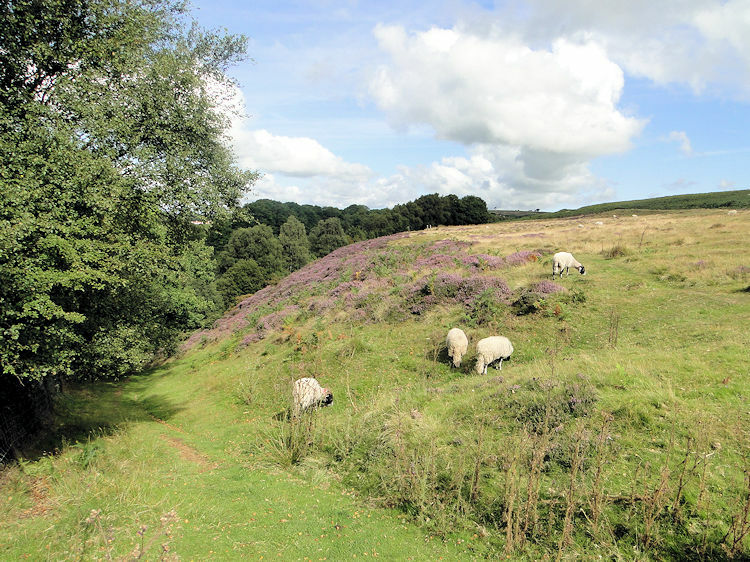 I was now at Mill Scar high above the village and while a few steps back I had been on a slight ascent I was now looking down into a huge cut in the land. Sweeping round down to my left was the railway I had been level with at the railway station minutes ago and 500 metres straight ahead was the other side of the cut. 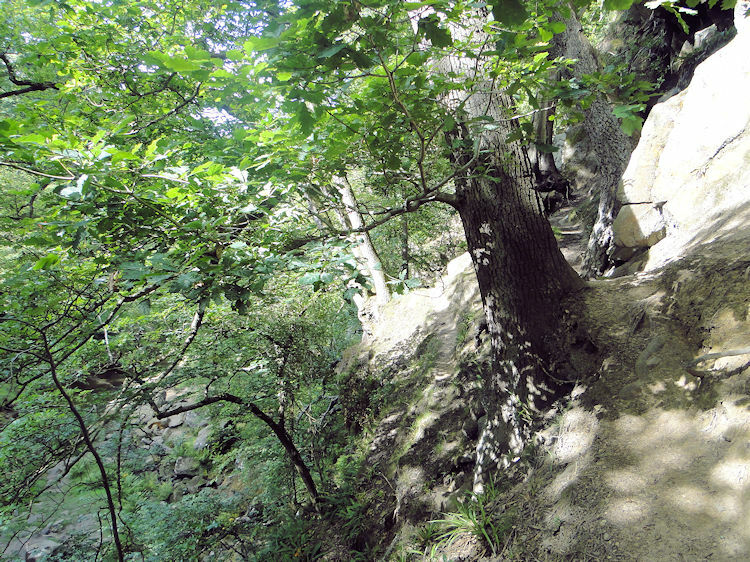 With no option but to descent rapidly and then cross the cut to ascend steeply I did so but as I walked I admired the setting, a beautiful piece of natural sculpture that had shaped a fantastic piece of land. A period train passed by on the line, whistle blowing as it passed. A perfect moment. Two houses were placed in the midst of the beauty, both excellently presented with perfectly maintained gardens and no doubt both were much coveted properties. Making my ascent out of the cut of Darnholm I puffed my way up, a steep 60 metres of 1:2 gradient made all the more tiring by the sun which had by now broken though and was dominating the diminishing clouds. The weather had improved, it was now set fair. After the delights of Darnholm and the short strenuous climb out the cut I was again at height with even more spectacular views entrancing me. I crossed open moor north of the village, staying high for a good while and soaking in the brilliant surroundings of a brilliant day before making my first full descent to water. Losing the 60 metres height I had worked hard for in an equally steep descent I came down to a path fenced to the left of me barring access to Eller Beck. Note: this next passage in red text is what I did. I recommend you do not. Instead refer to the instructions in bold black italics below this first passage of red text before returning to my story in normal black text. As I walked along the path I was attracted to the sound of rushing water which I could not see for dense foliage blocking the view. A little further on the path I reached a railway bridge crossing the beck. 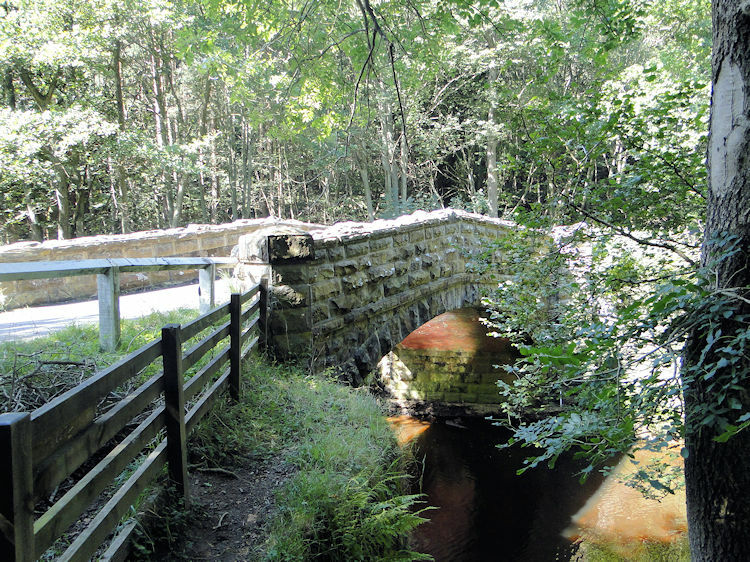 The bridge harked my point of scampering down the path to the water's edge. 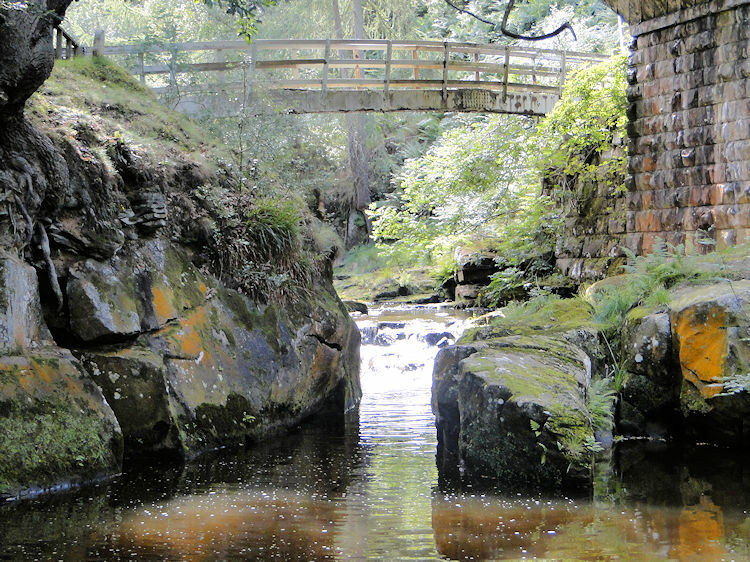 Once there another supreme moment for by looking back through the arches of the bridge straddling the beck I got a first class view of my target, the small but attractive waterfalls of Water Arc Foss. It was a wonderful sight and my best shot of the waterfall meant wading into the beck. Thus, the photograph of the waterfall above was taken with me standing in the beck and shooting the picture directly through the railway bridge central arches. It took a bit of care to get down to the water and then into the rocky bed of Eller Beck but not as much care as what was immediately ahead of me. 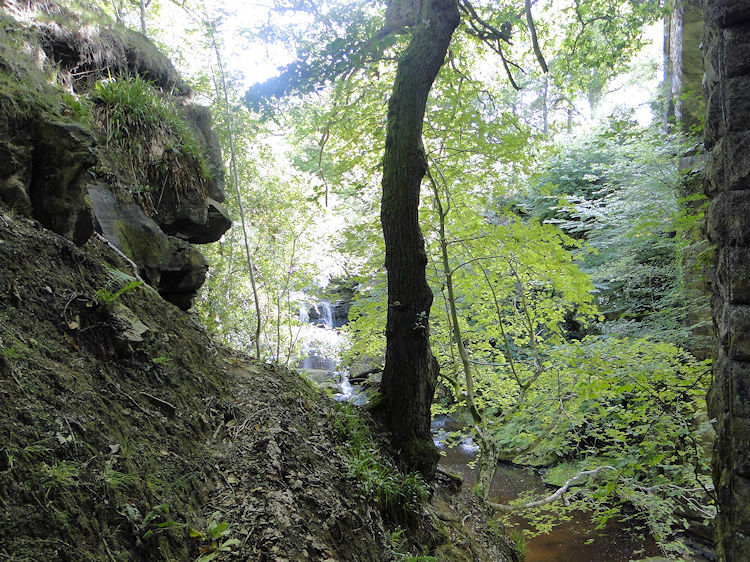 Note of warning: Do not follow my scramble down to the beck and subsequent walk along the scary path. 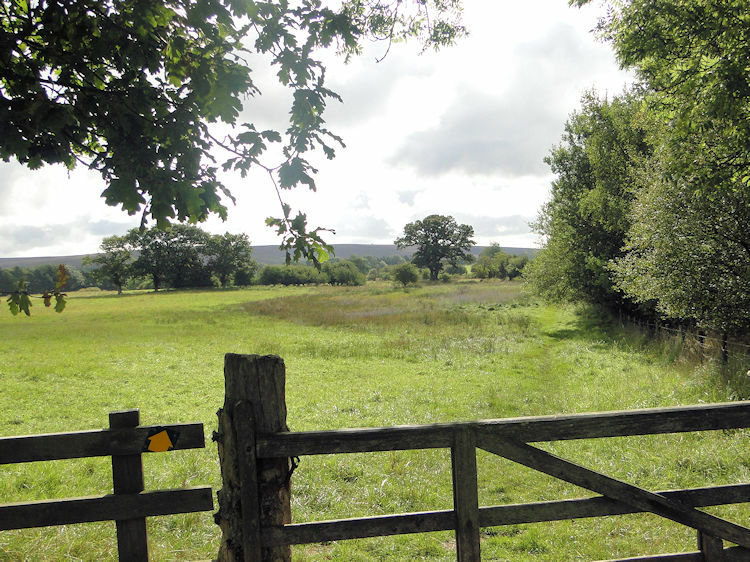 Instead follow the marked path shown on the map which goes along the north side of the railway to Hill Farm before following the road to Beck Hole from where you can follow a marked path due east parallel to the south side of the railway to Thomason Foss. 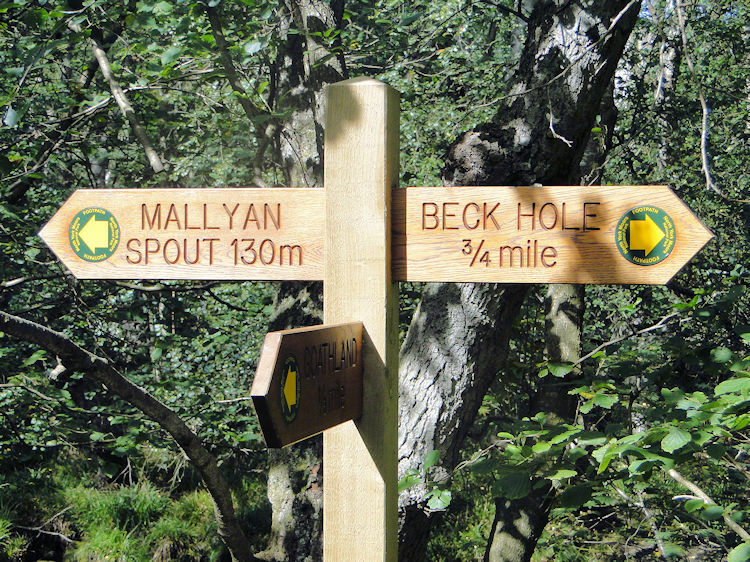 Return to Beck Hole to follow the walk to Mallyan Spout. The scramble down to the waters edge from the railway bridge had required care, it was steep getting down and what followed after the waterfall photo shoot was even more demanding. The Ordnance Survey map shows a clear dotted green line permissive path all along the side of the beck from Water Arc Foss to Beck Hole and this is exactly where I was going but the path drew me up to a height of 20 metres above the water. 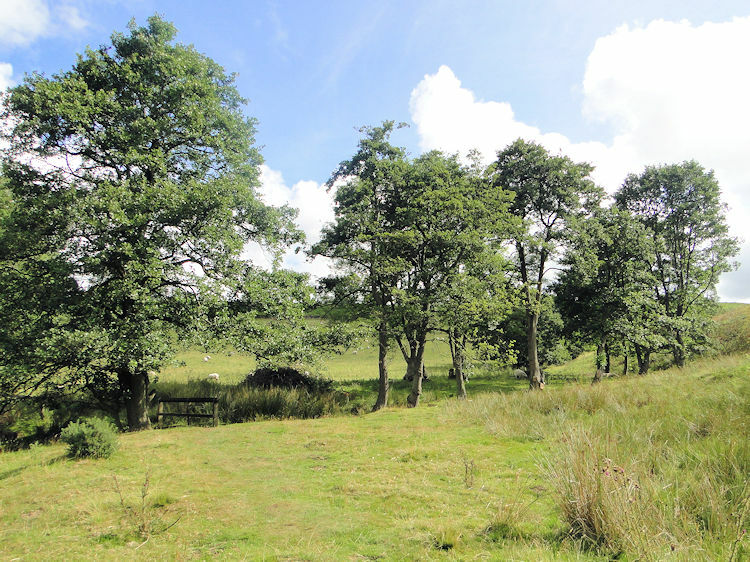 I could not see a path at the beck side so up I went and as I did so the path got narrower and narrower. In fact it was quite scary and if the ground had been wet and slippery I would not have continued on it; I would have returned to the beck side and found a way along the bank. As it was dry the scary path was manageable and I carried on for about 60 metres of scary walking before the path levelled off and the sheer drop to the left and to certain trouble disappeared. I was relieved and at the same time ecstatic for despite the caution of the scary bit the adrenaline rush was great. Continuing on through the woodland path close to Eller Beck I came out of the tree avenue at Beck Hole. 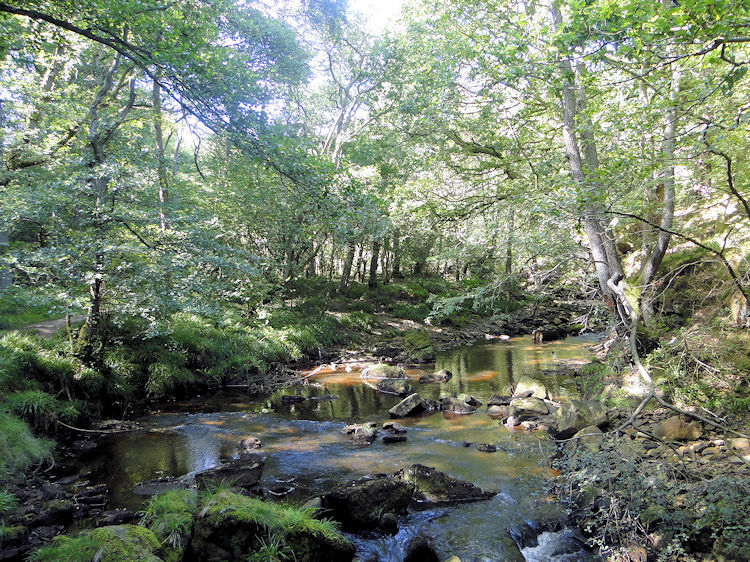 Beck Hole is a lovely quiet place where a young family were enjoying the immense fun of paddling in the beck while a couple were sat outside of the ideally situated Birch Hall Inn enjoying their drinks. For me, no drinking yet although the Lucozade boost was not too far away. After a very short walk on the road at Beck Hole I left to follow a track on just after passing the pub, a track that took me through a paddock to a choice of routes. Straight on went to Goathland directly while my choice went south to skirt Carr Wood. I knew I was on the right track, a sign had indicated it was 'To Mallyan' and that was exactly my intention. 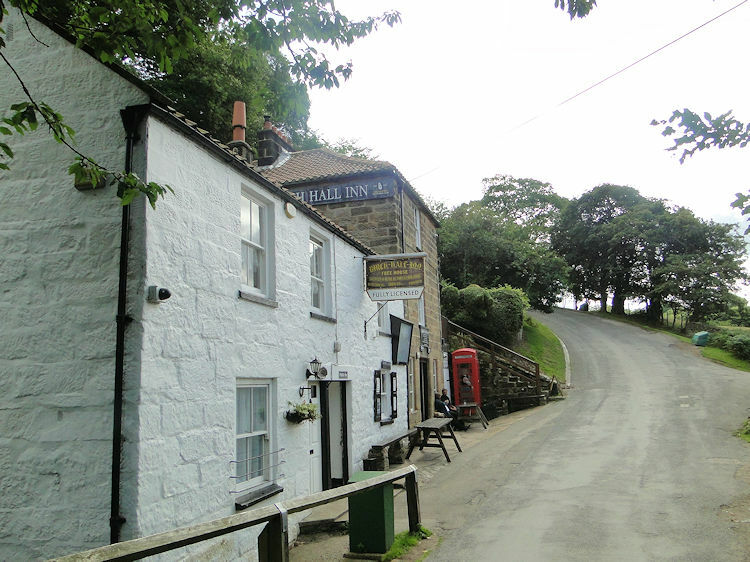 After the joys of the walk so far with all the amazing views of countryside, geological scars, moorland, beck's and waterfalls and also the thrill of the scary bit I was hyped but to date I had not stopped for a drink. Another incline up a wooden stepped stair saw me flag though and so at the gate in the picture above I finally ceded to fatigue and took a drinks break. The obligatory Lucozade boost was had during my brief rest which was short as I wanted to get on with the walk. Suitably boosted I fair marched the next few hundred yards along the edge of Carr Wood until I reached a sign saying 'Mallyan Spout 130m' which made me beam. I was reaching the pinnacle of my walk. I walked that 130 metres in the thrill of looking upon the fabulous Mallyan Spout waterfall and when I arrived I was not disappointed. 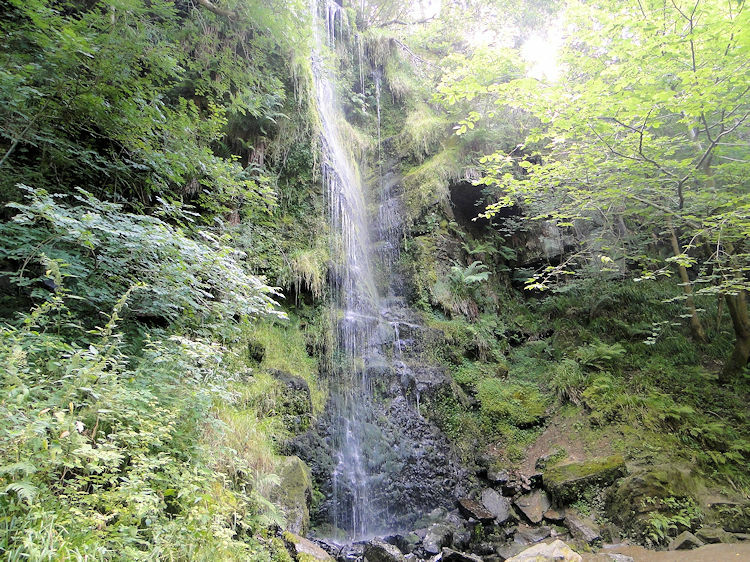 Mallyan Spout is a delicate waterfall with about a 60 feet drop in which the water seems gossamer with a delicate fall accentuated by a curtain of green moss and vegetation giving a marvellous canvas. It was incredible to witness. 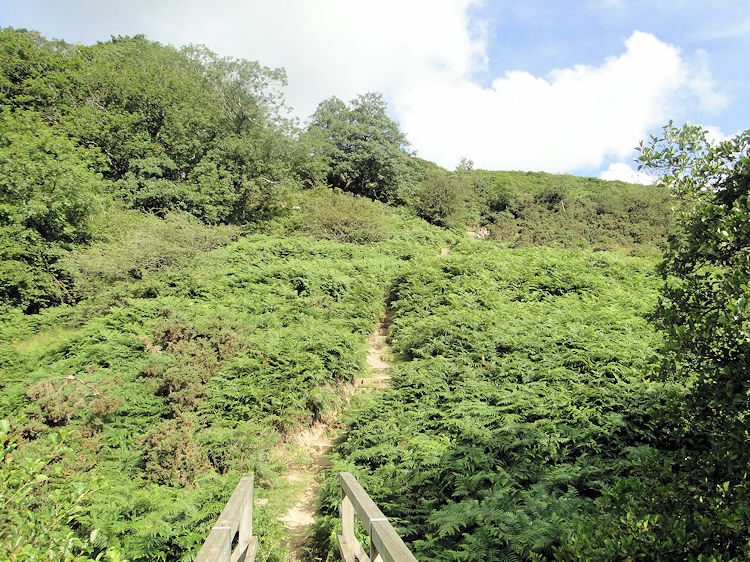 From the pleasure of the magnificent waterfall I followed West Beck upstream by first crossing a wooden footbridge in the depths of Scar Wood which led me to a choice of paths. By ascending south out of the wood I could have been back at the car in no time but the walk alongside West Beck in Scar Wood was one of the best. The sun glinting through the tree tops was exceptional, the sound of the beck as good as the best live concert. I walked on in rapture as I followed the lovely beck upstream. 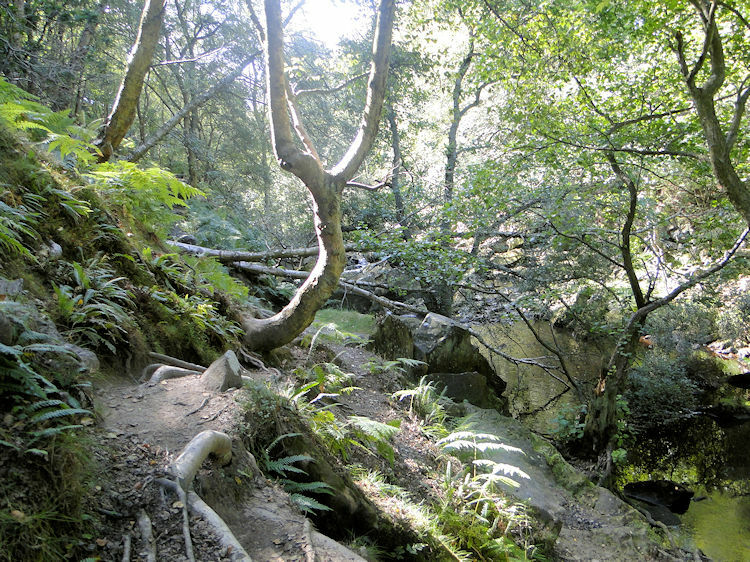 As I did so the first wet patches of the whole walk, apart from my intended step into Eller Beck had to be negotiated and also the path sometimes became erratic with steps up from the beck to cut past narrow passages, some of them so tight that trees had to be availed of as stepping places. It was a thrill. After a few more tricky steps I emerged from Scar Wood at a road bridge which heralded my final ascent of the day by following the road up to above New Wath Scar. 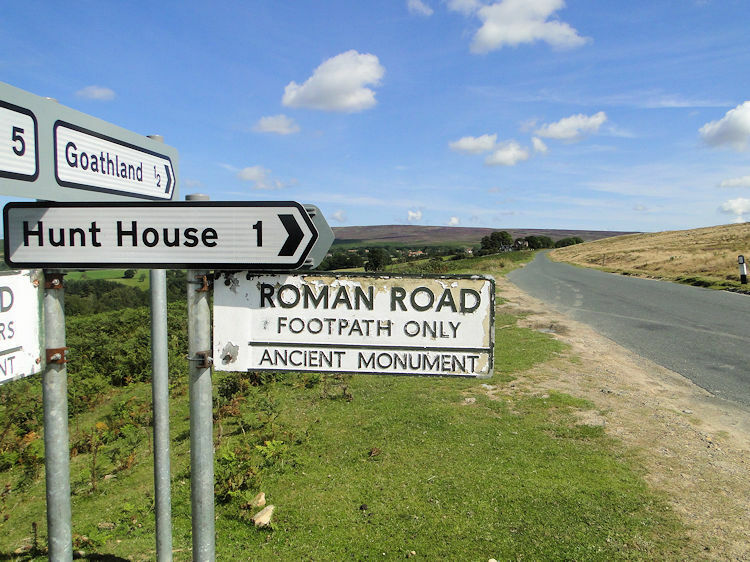 After another short sapping climb I reached a road junction with Hunt House Road heading due south and my road to Goathland heading due east. There was a generous grassed verge to walk along, trimmed to lawn like conditions by the local sheep which was a pleasure to tread on as I made a lovely slight descent along the road back to the car. As I did so I imagined this jewel of a walk and all the adventures I had over the last three hours of walking it. It was a brilliant day out and as a result I will be looking out for similar walk opportunities in this area. Outstanding.